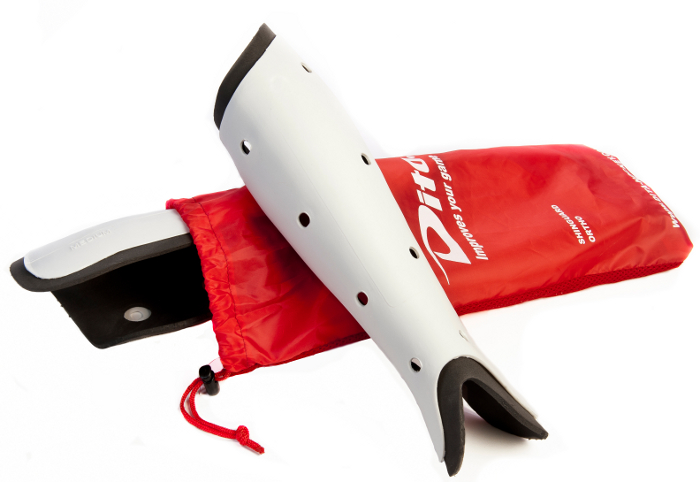 This solid Plastic shin guard is form fitted to your leg. It offers the maximum protection possible for your entire shin. The outside is a hard shell with ventilation holes. Comes with a storage bag. Orthos do not have straps, they are held in place by wearing outer socks. Before ordering, measure your leg. For proper fit, the high side is worn on the outside of the leg. Measure along the shin bone from the ankle joint to just below the knee cap, or 1" under if preferred. Measuring with hockey shoes on may help get a more accurate length. The Sizing is ADULT. THE PAD CAN BE CUSTOM FIT BY HEATING BRIEFLY WITH A HAIR DRYER. Liner socks can be purchased at sporting good or hiking stores (Dita no longer makes them) between your leg and this pad. This helps reduce cases of contact dermatitis and prevents the foam from sticking to bare sweaty skin which can lead to unnecessary wear to the foam, which is NOT replaceable.